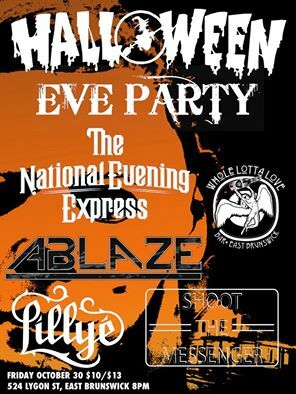 Halloween killer night of bands with The National Evening Express, Ablaze, Shoot the Messenger! Buy Tickets at the door $15 or if you turn up in a Halloween costume, just $10. There will be a Merch Pack with Cds, Tshirts and other goodies from all bands for the best costume of the evening!